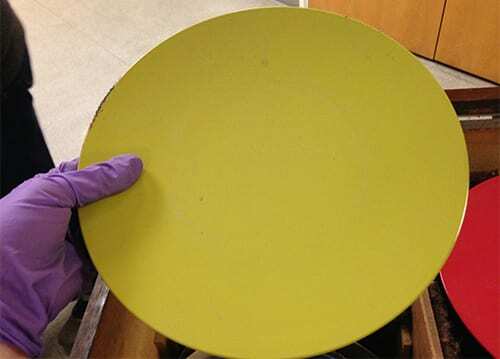 At the end of January this year, we embarked upon an archival deep cleaning mission here in the Design Archives. Archival deep cleaning is not something to be taken on by one person alone but requires a minimum of two people – not only for health and safety reasons, but in order for it to be a practical exercise. We were fortunate enough to be in a position to be able to hire freelance conservator colleague Kristy Woodruffe to come in and help me – and more so for her to say yes to this rather laborious and time-consuming task! Fast forward to now, and taking into consideration we have been working on the project on average a day per week, the two of us have made considerable progress. The dusting and vacuuming of boxes and shelves in itself is not something to get excited about, but while working through our collections aisle by aisle, we also came across some more actual objects in our care. As you will know, our collections are mainly paper-based, so ‘unearthing’ more 3-dimensional objects to add to our small collection of them was quite exciting! 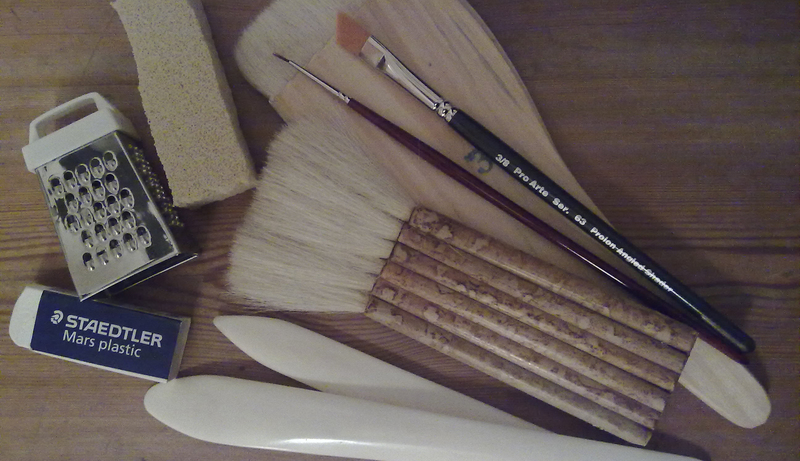 They came in the shape of various sizes of wooden boxes with objects housed within. 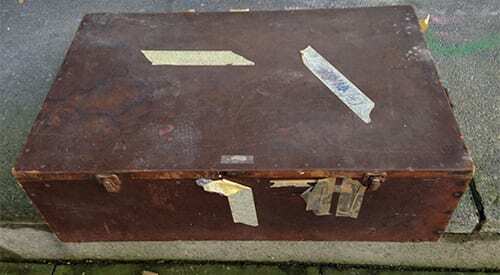 The boxes were a part of the County Council of the West Riding of Yorkshire Education Committee’s School Museum Service, and were used for educational purposes. They held within them some Council of Industrial Design’s Duke of Edinburgh Award winning objects, having been given the award for their good design. The boxes hadn’t been looked into for quite some time, and Kristy and I took precautions by wearing masks and gloves before opening them. 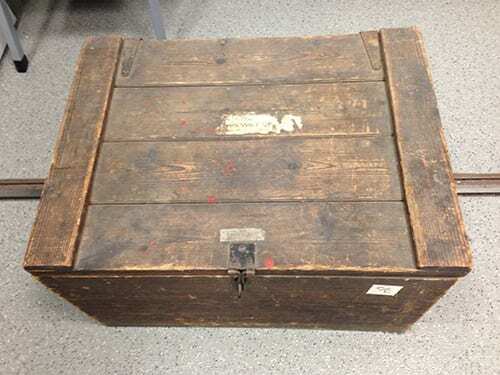 The crates were not suitable for archival storage, so we investigated what was inside and re-housed the materials in a more archive-friendly manner. The very first box we opened contained within it plates and other pieces of miscellaneous kitchenware. I personally have a real soft spot for these plates. I have memories from the big digitisation project I undertook in 2006, scanning and cataloguing the photographs and colour transparencies of the objects which had won the Duke of Edinburgh’s Design Award, all housed in the Design Council Archive. The digitisation project took place to celebrate the Awards’ 50th anniversary and I – for reasons unknown to me – specifically fell in love with a 5×4 colour transparency we have in our photographic collection (catalogue number: DCA-30-7-1960-3-1) showing these plates (below). 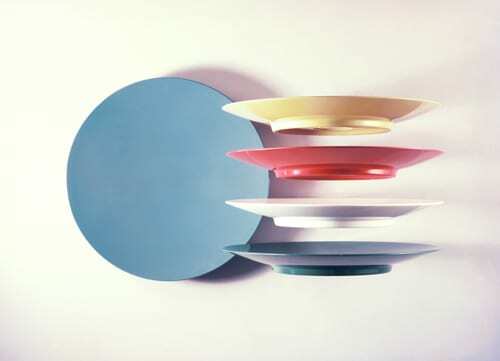 The plates are called Fiesta and made from melamine. They were designed by Ronald E. Brookes and manufactured by Brooke and Adams Ltd. They were one of the eighteen designs winning the Duke of Edinburgh prize in 1960. It is so lovely to know we have these plates as physical objects too! 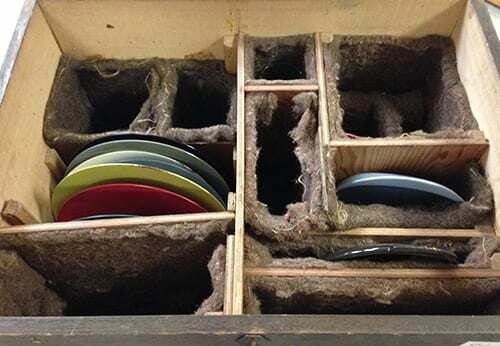 They had some unknown sticky substance on them, so they were thoroughly washed and dried before re-housing more appropriately. 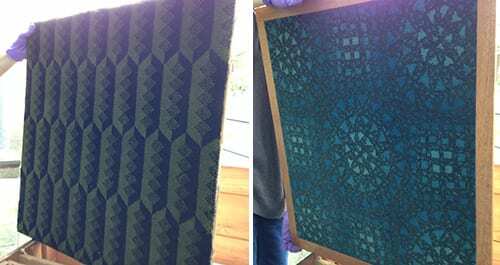 You might remember that back in 2013 we had two carpet samples from the Design Council Archive conserved. During deep cleaning, we made a discovery of two more carpet samples. Both of the ‘new’ samples were stored in one of the wooden boxes and were adhered on wooden backings. The carpet samples were mouldy on the carrier side and the samples themselves had evidence of moths. As we did back in 2013, they were take to local textile conservator Zenzie Tinker‘s studio for treatment. A textile conservation student Emma Hartikka on a placement at Zenzie’s studio has kindly written a guest blog entry about the work involved, so be on the lookout for that soon! 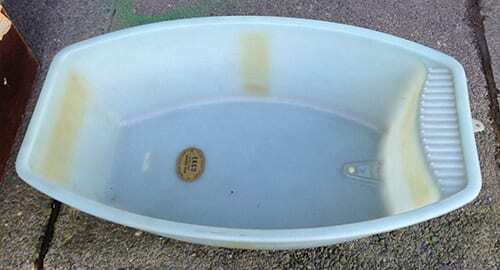 To mention another object we uncovered, I feel like I have to give the baby bath some airtime! 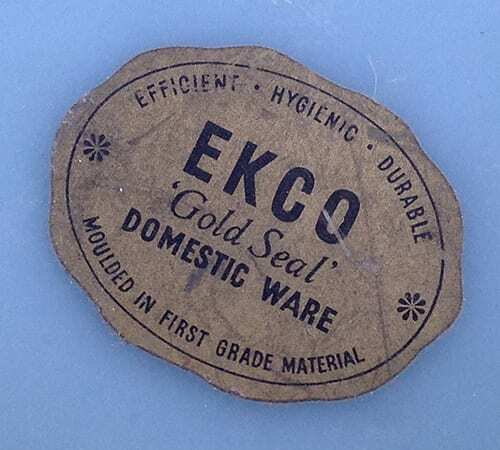 The Ekco Gold Seal Superbath was one of twenty products recognised by the Duke of Edinburgh Prize in 1958. 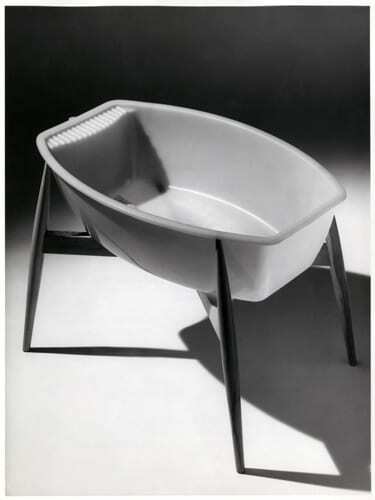 It was designed by MO Rowlands MSIA and manufactured by Ekco Plastics Ltd. Below you can see the digitised black and white photograph we have of it in the Design Council Archive online (catalogue number DCA/30/7/1958/4/1). The bath comes with wooden legs to stand it on. One of the reasons for wanting to mention it is that our Archivist Sue Breakell has a cream-coloured version of this design in which she was bathed in when she was a baby, so there is a lovely personal connection to it within our team! I am especially fond of the ‘Gold Seal’ sticker which still remains intact at the bottom of the bath. As I mentioned before, we do not hold many 3D objects in our care here in the Design Archives and are by no means ‘known for’ having them, so it is very refreshing to see these, and other, items in the flesh – especially after so many years of working with (mainly black and white) images of them! Such an interesting post! A bit of trivia, on the TV show The Mentalist, the lead character Patrick Jane drinks out of a turquoise Fiestaware cup, which is why you will find them to be more expensive than the other colours. Another fascinating blog entry. I am never in on the days when the deep-cleaning takes place so it’s great to have an update on progress and what has been uncovered! It’s a dirty job but someone’s got to do it!